In 1980 Saudi Arabia nationalized an oil company that had until that time been known as the Arabian American Oil Company. Christened with a new name, Saudi Aramco, and a single sovereign shareholder, the nationalized company continued to do business as before, but as a wholly-owned enterprise of the Saudi government. Saudi Arabia has had a spotty IPO history. The Saudi stock market is less than twenty years old. The first initial public offerings were successful and investors profited. Unfortunately, too many came to believe that it was impossible to lose money in an IPO. In 2006, a bubble formed and when it burst, investors were stunned. In one year, the stock exchange lost 52% of its value. The country’s regulatory agency, the Capital Markets Authority, started restricting such offerings. When it comes to money, memories are short and yesterday's lost dollar is quickly forgotten in view of the quick buck to be made tomorrow. Spurred on by low oil prices and hungry advisors, the Kingdom has announced that it is considering a Saudi Aramco IPO, that is, privatizing the company. The world sat up and took notice because Saudi Aramco is the largest oil company in the world. The common wisdom is that this will be a good move for Saudi Arabia and will help the Kingdom shore up its currently ailing balance sheets. But there are more than a few stop signs along the way. Like most government institutions in a country where young graduates aspire to a government job, Saudi Aramco is bloated with Vice-Presidents and other upper-level managers. It has grown fat. If Saudi Aramco is to be run more like a business this fat will be trimmed. Those who lose their jobs won’t be happy. An IPO is not simply a question of setting a price, selling shares to the public and standing back to see what happens. Due diligence will have to be performed prior to the IPO. This means audits and inventory. The eyes of the world will be on Aramco’s oil reserve estimates, but trained eyes will want to see the results of audits. The long-postponed audit of the Materials Division, for example, will have to be performed, and the millions of dollars of missing equipment explained. The contractor suffering a two-year ban because it was selling missing Aramco equipment in Abu Dhabi will have to explain what most would call a theft. Panicked Aramco officials figure that they can bury such matters in a footnote. Beware: the analysts at Goldman, Sachs know how to find and read buried footnotes. And they are very, very good at it. A Saudi IPO will mean the loss of Aramco’s sovereign immunity in the United States. Under Mendenhall v. Saudi Aramco, 991 F.Supp. 856 (D.Tex. 1998) Aramco has been able to ignore the U.S. court system in disputes with suppliers and employees. No longer: the reason the courts have granted Aramco immunity is because up to this point it is a creature of the Saudi state, with one shareholder. Once the company’s shares are publicly traded this will no longer be the case. There will be no principled reason to maintain the immunity. Aramco will be susceptible to suing and and being sued like any other company. The Deputy Crown Prince, HRH Mohamed bin Salman bin Abdulazziz al-Saud, is on record saying one of the benefits of the IPO will be greater transparency. He is absolutely correct. There is much corruption that will be uncovered during this process and it will not all be just in the Materials or Contracting Divisions. 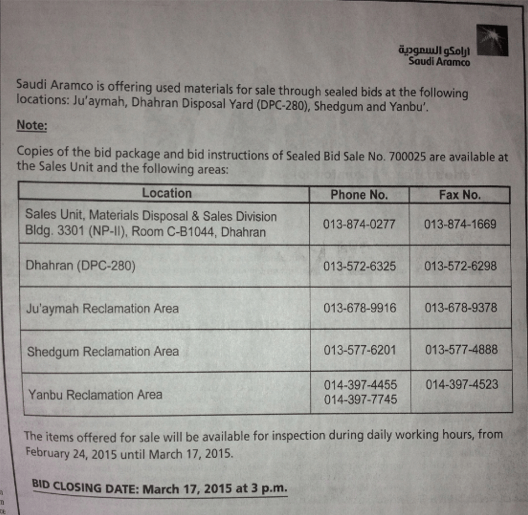 The Kingdom expects to maintain control over Aramco by only selling a minority position to the public; say 10% or so. This is great idea in theory but here are three new words never heard before in the Aramco context: shareholder derivative lawsuits. Shareholders will expect dividends to be declared. Other management decisions will be closely scrutinized by investors. The courts can and will order management decisions to be changed. One of the ostensible reasons for the Saudi Aramco IPO is to shore up the Kingdom's balance sheets. Owning 90% of a company whose shares are valued in the hundreds of millions of dollars will surely help, right? Not necessarily. As Prince Walid bin Talal discovered, Forbes magazine (and the aforementioned footnote readers at Goldman Sachs) failed to value thinly-traded Kingdom Holdings stock as highly as he would have liked. The same will apply to the value of thinly-traded shares of the newly-privatized Saudi Aramco. The effect on the Kingdom's balance sheets won't be as dramatic as some would advise. The enormous amount of money and advisory fees to be made will blind most to the consequences of the Saudi Aramco IPO. Consider this note a preview. The opinions and screed expressed above are those only of the author and may not be attributable to any law firm or institution in Saudi Arabia or any other country, virtual state or functional equivalent. This article is released under a Creative Commons license and may be copied freely. A credit would be nice. Photograph of Arabian American Oil Company internal currency from http://www.coinbooks.org/club_nbs_esylum_v17n24.html. In a reported 2004 case involving Saudi Prince Walid bin Talal's Kingdom Holdings, a United States district court was asked to analyze whether or not the ancient shari'a doctrine prohibiting gharar (uncertainty)--a prohibition as strong as the Islamic prohibition against interest-- applied to the valuation of a company's securities. This is not a trivial question because under Islamic contract law, uncertainty vitiates contracts, including contracts for the purchase and sale of securities. "[Kingdom Holdings] contends that if the Court were to reject the Guideline Company Method [a method for the valuation of companies], that rejection would imply that no one in Saudi Arabia could enforce a contract to buy or sell shares of stock in a company to the extent the price did not reflect the tangible value alone of that company's assets. This may very well be the case." So if Prince Walid was right in 2004, the value the shares of an Aramco subsidiary sale (or 5% of Aramco) would be limited to a percentage of "the tangible value alone of the company's assets." While this decision is "only" a decision of a United States District Court and not a higher Court of Appeals, for an Aramco IPO to be successful this decision must somehow be explained away. Because the U.S. decision is based on Saudi law, at the very least it would take a decision from Saudi Arabia's Board of Grievances permitting gharar to set things straight. Standing against such an advisory opinion are centuries of Islamic jurisprudence. Pricing an IPO will have to take this opinion into account or at least find a way to distinguish it. That may not be easy. In any event, the opinion creates yet another roadblock for an Aramco IPO. Whether the New Jersey opinion is followed or not, this is precisely the kind of problem that obtains by removing Aramco's sovereign immunity. Before Aramco could just say, "go away." Once sovereign immunity is removed, Aramco will no longer be able to do so.